For the purpose of financial aid, the United States consists of four different regions: South, Midwest, West, and New England. States within these regions have different types of agreements that allow students from one state to receive reduced out-of-state or in-state tuition in a neighboring state if their home states do not offer their desired degree programs. Schools in some regions offer discounted tuition to out-of-state students regardless of their degree programs. The following map depicts the South, Midwest, West, and New England regions of the United States. Schools in states within these regions may participate in a variety of programs to provide financial aid to out-of-state students from the same region. Note that Iowa, New Jersey, New York, North Carolina, and Pennsylvania do not have memberships in any of the regional programs. The New England Region includes Connecticut, Maine, Massachusetts, New Hampshire, Rhode Island, and Vermont. There is one program available to students who live in these states. New England Regional Student Program: Students who live in the New England Region and gain admittance to uncommon college programs in other New England states may be eligible to receive reduced tuition if the same programs are not offered at any of their in-state institutions. To search for available programs for residents of your state, click here. The Midwest Region includes Illinois, Indiana, Kansas, Michigan, Minnesota, Missouri, Nebraska, North Dakota, Ohio, and Wisconsin. There is one program available to residents of this region. Midwest Student Exchange Program (MSEP): If you are a resident of one of the Midwestern states and are planning to attend a college or university in another Midwestern state, you may be eligible for reduced tuition. Public institutions that take part in MSEP have agreed to cap an out-of-state Midwestern student’s tuition at 150% of the school’s in-state-tuition. MSEP private institutions have agreed to give a 10% discount on tuition. Some schools limit participation to a certain number of students or require that students meet specific admission standards to qualify. For more information, click here. The South Region includes Alabama, Arkansas, Delaware, Florida, Georgia, Kentucky, Louisiana, Maryland, Mississippi, Oklahoma, South Carolina, Tennessee, Texas, Virginia, and West Virginia. There are two programs for students in this region. Academic Common Market: Consider the following scenario: None of the schools in your state offer your prospective degree program, but you can’t afford to pay out-of-state tuition. What do you do? Easy, you search for programs through the Academic Common Market. If you are a Southern student admitted to an uncommon college program in another Southern state and the same program is not offered in your home state, you may be eligible to receive in-state tuition. To search for available programs for residents of your state, click here. Regional Contract Program: This program is open to students who are pursuing their first professional health degree at out-of-state schools. Eligible health fields include dentistry, medicine, optometry, osteopathic medicine, podiatry, and veterinary medicine. This program is currently only open to students who live in Arkansas, Delaware, Georgia, Kentucky, Louisiana, Mississippi, or South Carolina. Students participating in eligible programs will pay in-state tuition at public schools or reduced tuition at private schools. To learn more, click here. The Western Region includes Alaska, Arizona, California, Colorado, Hawaii, Idaho, Montana, Nevada, New Mexico, North Dakota, Oregon, South Dakota, Utah, Washington, Wyoming, Guam, and the Commonwealth of the Northern Mariana Islands. There are three programs for students living in this region. Western Undergraduate Exchange: Participating institutions offer out-of-state Western undergraduate students reduced tuition that is not to exceed 150% of resident tuition. Some schools limit the number of students who can participate, so applying early will give you a better chance of receiving the discount. For more information on participating schools and application procedures, click here. 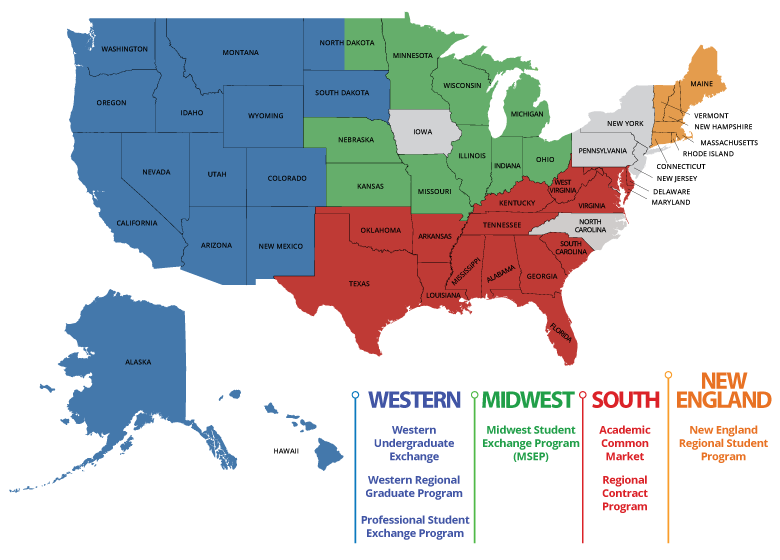 Western Regional Graduate Program: This program allows residents to enroll in available graduate programs (master’s degree, graduate certificate, and Ph.D. programs) outside of their home states at in-state tuition rates. Some programs have extra requirements for students who want to participate. Learn more here. Professional Student Exchange Program: Students majoring in eligible health care fields can enroll in selected out-of-state professional programs, typically when their desired degree programs are not offered at any of their in-state schools. Students will typically pay in-state tuition rates at public universities and reduced tuition rates at private institutions. Eligible health fields include dentistry, medicine, occupational therapy, optometry, osteopathic medicine, pharmacy, physical therapy, physician assistant, podiatry, and veterinary medicine. To learn more about participating states and programs, click here. If you fit the qualifications, these programs can provide a significant financial break from what you might have to pay at another school. However, you shouldn’t consider an uncommon program simply for the financial benefits. Follow the path that you want to follow and find financial incentives to fit your needs, not the other way around.